As per the FAQ, a user needs atleast 50 Reputation points in order to leave comments globally on the site - one can always comment on one's own questions and answers and answers to questions one has asked. This means that a user needs atleast 50 Reputation points to comment on a question posted by another user. 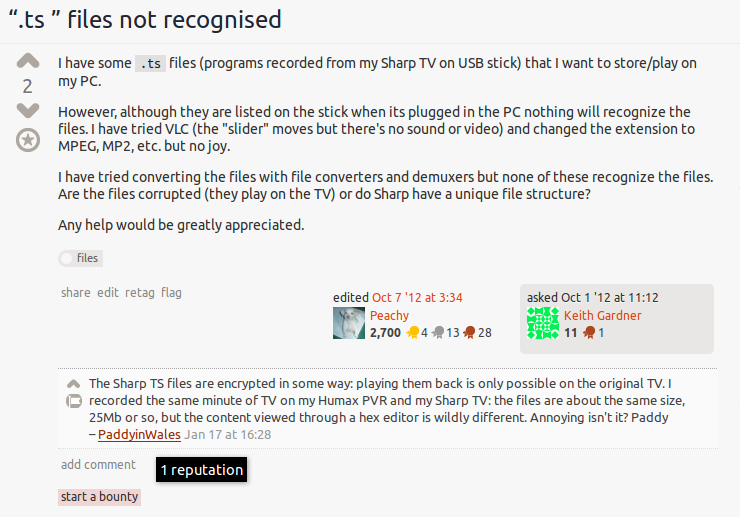 So, how can this unregistered user (PaddyinWales) leave this comment? He/She has just 1 Reputation Point. I don't think this should be a bug (although it could be). The user placed an answer on the question that was actually a comment. As such a moderator converted their answer to a comment. Should comments that answer a question be marked obsolete after full answers are posted? Is it fine to comment to an answerer or asker to remove his/her answer or question? Why not moderate questions from new users before making them visible on site? Should the default answers sorting be changed? How can I improve my question to attract meaningful answers? Can considering 75505 Questions as unanswered be useful?